Sampson terminates Hanwha’s ‘dark history of foreign pitchers’. August. 11, 2018 07:17. by Bae-Jung Kim wanted@donga.com. 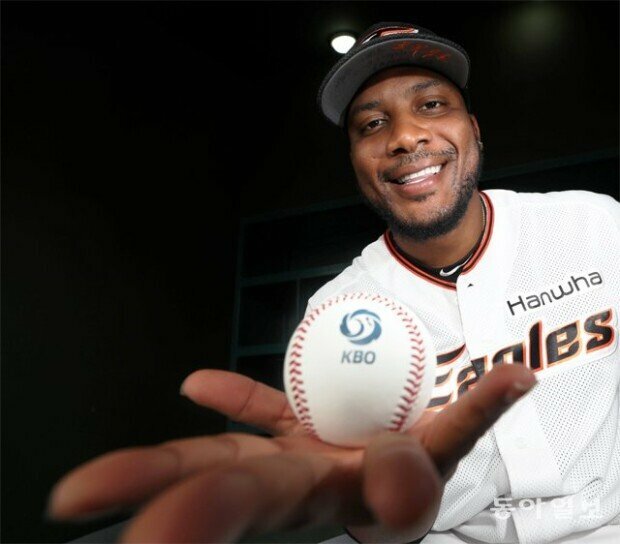 Just ahead of the opening of this baseball season, Hanwha Eagles manager Han Yong-deok was very confident about the potential of expat pitcher Keyvius Sampson (27) his team newly recruited. Many considered his words to be merely "lip service" as Sampson’s annual salary was much lower at 700,000 U.S. dollars compared with other foreign pitchers in the team who were paid over 1.5 million dollars last year, and because Sampson easily failed on the mound during the spring training camp. Sampson earned the starting pitcher status, the symbol of an ace pitcher, but he gave two losses (ERA of 12.46) even before completing five innings in the first two games of the season. As a result, the team was seen poised to continue to struggle amid the lingering dark history of hugely disappointing alien pitchers as the team had never recruited qualified foreign pitchers for 20 years. Sampson is capable of pitching fastballs of over 150 kilometers per hour, but did not possess stable pitching control. But thankfully he accepted advice from pitching coach Song Jin-woo, who advised him to shift his stepping foot (left foot) that was directed towards the right handed batter to towards the catcher, and addressed his unstable pitching control when pitching from April. Foreign players who experienced big leagues such as the Major League Baseball are highly self-confident and generally reluctant to accept others’ advice, but Sampson embraced advice to transform into a "Korean style foreign pitcher." Sampson’s biggest strength is his "ability to strike out batters." He has 161 strikeouts to rank first in this season, beating over Henry Sosa of the LG Twins by seven. Having posted 10.9 strikeouts per nine innings, he is overwhelming No. 1 among the pitchers who have pitched more than 100 innings in this year’s KBO League. He has even earned the dreadful nickname "serial strike-outer" as he has recorded successive strikeouts in many decisive moments. Sampson, who is now effectively living up to his title "ace pitcher," had also the joy of becoming a father recently. He had to return to Korea after summer vacation before his son was born, but since learning about his child’s birth, he is having seven video calls per day to see his son in person as part of daily routines. Seeing him all smiles, one can easily tell he is undeniably a "loving father" crazy for the son.